Midcap stocks are high-risk high-return stocks. Midcap stocks can make you wealthy. For an example, you might not have heard about midcap stocks Kaveri Seed or Jubilant Foodworks before a couple of years, until these stocks became multi-bagger. So what are midcap stocks? Which are the Best midcap stocks for investment? 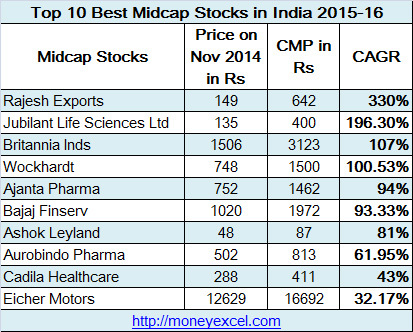 Mid Cap stocks investment is a good or bad strategy? Let’s try to get the answer of all these questions. Mid-cap stock is a company with a market capitalization in the range between Rs.100 crore and Rs.1000 crore. Mid-cap stocks are high-risk high-return stocks. Mid-cap stocks are like mid age child, it will grow big in a couple of years. However, all midcap stocks will not turn out as big large cap stock. You must select midcap stock carefully for investment. 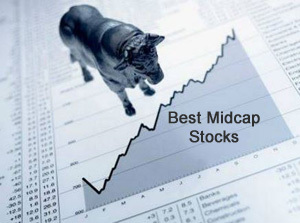 How to identify best midcap stocks? It is very difficult to identify the best midcap stocks, however, you should consider following factors while identifying best midcap stocks. These stocks should have sustainable earnings and revenues over a couple of years. Profitability of this stock should be consistent. These stocks should have a strong balance sheet in terms of low debts. These stocks should be available at reasonable price. These stocks should have generated a good return in past 2-3 years. Midcap stocks are high-risk high-return stocks. It is good or bad for investment that you can decide based on pros and cons of these stocks. Mid-cap stocks tend to offer higher growth opportunities than their large-cap counterparts. These type of stocks fall harder in a falling market. These type of stocks may not give your large return quickly. Should you invest in Midcap stocks? Investment in midcap stock is good investment strategy. You should include midcap stocks in your portfolio. However, you should be cautious for selection of these stocks. If chosen carefully, mid-cap stocks can make you wealthy. Midcap stock is a good bet for season investor. If you are risk adverse investor you should stay away from these stocks. What is your take on midcap stock investment? Do share with us. For investors not being experts in midcaps many recommend investing through madcap schemes of mutual funds some of which have given great returns..